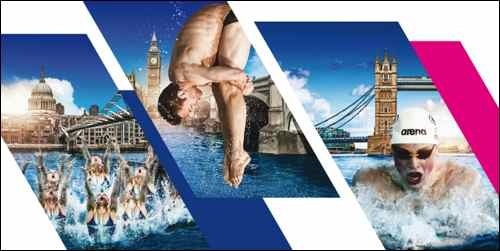 In less than two month’s time the iconic London Aquatics Centre at Queen Elizabeth Olympic Park will host its biggest event since the 2012 Olympic and Paralympic Games. The London 2016 LEN European Aquatics Championships will feature Team GB’s medal hopefuls for the Rio 2016 Olympic Games and will be the last chance to see the likes of Tom Daley, Adam Peaty and Jazmin Carlin compete before they go. 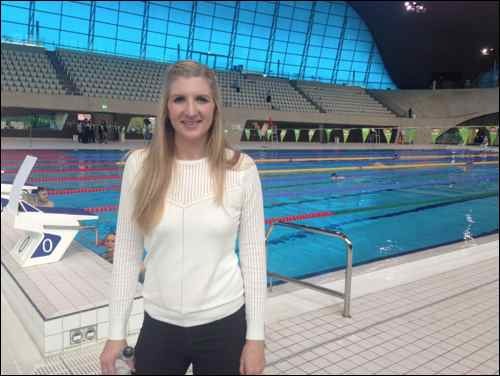 Double Olympic champion (2012) and new mum Rebecca Adlington talks exclusively to London Mums about her support for this event to bring the legacy of 2012 back to London. With over 900 of the continent’s best swimmers, divers and synchronised swimmers all battling for champion status, it is an extravaganza not to be missed. Read the first part of the interview in this article. The second part of the interview where Rebecca talks in depth about her experience with motherhood will be published in the Summer / Autumn issue of the London Mums magazine. There are 33 sessions across the two weeks of the European Aquatics Championships including four unique combined morning sessions of synchronised swimming and diving from May 10-13. These sessions are perfect for families with the London Aquatics Centre in the heart of the Queen Elizabeth Olympic Park and pass out system in place to allow for exploring. Whether it’s scaling the ArcelorMittal Orbit, discovering the adventure parks or even looking across at the other world-class sporting venues on the Park, there’s plenty of fun filled family times to be had during these four sessions. Q: Hi Rebecca, you are supporting the first European Aquatics Championships (EAC) to be held in the UK for more than two decades, on the 9th – 22nd May 2016. What are you particularly excited about this event? RA: I am really excited that the European Aquatic Championships will be hosted back at the London Aquatic Centre. Having the event back in London 2012 Olympic pool means that there will be home support for Team GB and the crowd is always great at an event like this. Q: Last time a major event was held in the Olympic Park’s Aquatic Centre, London 2012, you won 2 Olympic medals. Can you tell London Mums magazine an exclusive anecdote about your London 2012 Olympics? RA: For the London Olympics I had 4 suitcases full of kit, so I tweeted a picture of my bags with all my belongings out everywhere. I wrote a caption about being there at the Athlete Village in the Olympic Park and the next day, a newspaper printed my picture and wrote “Adlington Trashes Olympic Room”. I couldn’t believe it! Q: In the lead up to Rio Olympics a lot of pressure is put on athletes to bring back a medal. What is your recipe for success in sport? RA: Just hard work. I worked so hard and let the swimming speak for itself. There are a lot of athletes who say a lot of stuff but I just kept my head down and let the swimming do the talking. Any time that I felt doubt or pressure, I just remembered all the work I had done in the pool and used that as confidence, and I knew that no one else in the world was working as hard as I was, and that gave me a massive amount of confidence. I think that the athletes at this year’s Olympics just need to remember what they’re doing and focus on that, and look back on the good sessions that they had and perfecting what they did in training. I had a great coach and we had a great relationship; we worked so well together because we kept the communication open and really worked as a team. Q: You retired a few years ago from competitive sport. What will you be doing during Rio 2016? RA: I will be flying to Rio during the Olympics to work for the BBC as a swimming pundit. I absolutely love doing live TV and I am there to give my expertise and background of the sport. I am not there to judge and put the athletes down, as that doesn’t help them nor does it help the audience watching. I will be helping people understand how the athletes may be feeling after their races and why they may be feeling like that. Q: Last June you gave birth to your first child Summer. What are your views on body image and the pressure mums are facing to get back into shape straight after pregnancy? RA: I think for myself, it was my first child, so I didn’t feel the rush to get back into shape. I didn’t feel like anyone was pressuring me to get my body back. I’m still not back to what I was before I gave birth, and that’s fine. When you have a baby your priorities change. As much as I love working out and going to the gym, I don’t work out every single day, I work out three times a week and that’s it, because the rest of the time I want to be with my daughter. I think it just happens over time; when she starts nursery I will have a bit more time and I can get back into the gym more, but my body is not a priority when I can just take my daughter swimming or take her to a class. I just feel that my focus is on my child and being the best mum that I can be, rather than worrying about getting my body back. I didn’t start losing weight until about 4 months after I gave birth. I put on 4 stone during pregnancy so I just took my time with it. I still have some weight to shift but I don’t feel any pressure with that. That will happen when it happens, and I need to stop loving food so much in order to do that! Q: How has your view on life changed since having a daughter? RA: Life is completely different! I am now much more of a worrier. I never thought I was a maternal person but now I am always worrying about Summer – what can I do for her, who can look after her if I go away for work? In the past, I could just say yes to everything, whereas now I can’t; I need to think about what’s best for my daughter. Becoming a mother makes you a lot less selfish I have my ‘mum-head’ on and I’m always wondering if she’s OK. I would say that I am really ‘mumsy’ now. I don’t worry about petty stuff in my life anymore. All my focus is on her. Whenever I’m feeling a bit stressed, she’ll just smile at me and my heart melts, and I don’t think about the stressful things anymore. Q: What are your biggest challenges as a mum in the public eye? How do you balance your work life and your family life? RA: One of the biggest challenges is balancing work and motherhood. I definitely feel guilty being a working mum. A lot of new-mums will take 6 months maternity but I only took 2 months. I love my work and I want to give Summer the morals and realisation that you’ve got to work to be successful and get to where you want to be. My parents both worked when I was growing up and I don’t want Summer to become lazy and think that everything is handed to you on a silver plate. I never felt I missed out because my parents worked. RA: I would like to be remembered as someone who was always nice and friendly, someone who has done some great things in her sport and somebody who has inspired others. Q: What are you up to next? RA: I do some mentoring for other swimmers and a lot of them will be participating in the European Aquatics Championships this May at the London Aquatics Centre so I will be cheering them on at the event. After that, I am flying to Rio to do punditry for the Olympic swimming. I am so excited as I’ve never been to South America. I really can’t wait to be a spectator rather than a participant – it’ll be a whole new experience for me. Tickets for the Championships represent good value with two-thirds priced at £30 or under while there are also special prices for children and families. Combine morning and afternoon and afternoon and evening sessions for a full day of aquatics fun from May 9-13 and save 15% off. This entry was posted on Friday, March 18th, 2016 at 11:05 am and is filed under Mumpreneurs & Mums at work. You can follow any responses to this entry through the RSS 2.0 feed. Both comments and pings are currently closed.